Glen Window Cleaning is a commercial window cleaning company with over 60 years of experience, serving all types of companies, both large and small. 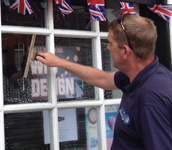 Whether you operate a multi-storey office-block, or just high street shop, we have the ability to take care of your windows, no matter their shape or size. Since 1950, we have been serving all types of businesses, from corner shops, to corporate chains. No matter the size of your business, we can provide a service which will not let you down. Whether you're in a state-of-the-art modern building, or a prehistoric listed castle, Glen Window Cleaning's trained employees will be able to take care of any obstacles in their way, not stopping until you are 110% satisfied with our service. Contact us today for a free, no obligation on-site quote and we'll discuss the most cost effective way of carrying out your cleaning. Glen Window Cleaning is able to clean all types of fascia and signage. Using our special equipment, we take extra care to ensure your fascia and signage does not get damaged. Our expert cleaners can transform your signage back to how they previously looked, when they were first installed. Call us for more information. The design, the materials and the entire construction process of a conservatory is quite an expensive one. That is why they need to be properly cared for. At Glen Window Cleaning, our trained staff use certified equipment ensuring your conservatory(s) are not damaged and benefit from the best cleaning service possible. You will not be dissapointed. With our professional pressure washing service, Glen Window Cleaning can restore pretty-much anything to its former beauty. From park benches to patios, we guarantee to impress. 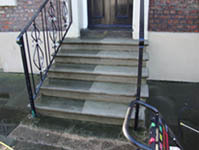 We can remove unsightly tyre marks, bird droppings, chewing gum, oil stains, weeds/moss and slippery algae. Call us on 0191 259 2006 for more information. Please do not hesitate to contact us for a free, no obligation quote!